Ivory Coast's alternative government is holed up in the Golf Hotel by the lagoon in the main city of Abidjan. Access to the hotel is denied by security forces loyal to President Laurent Gbagbo, who insists he won the presidential election which the UN and others say Alassane Ouattara won. Few journalists have had access to the hotel premises since the crisis over the results began three weeks ago. But on Wednesday a UN helicopter flew some of us over the lagoon to reach Mr Ouattara's makeshift headquarters. We landed in the garden, next to tents for the UN peacekeepers. 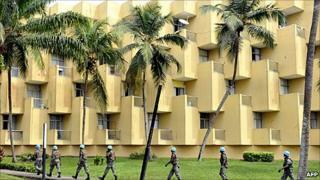 About 800 UN troops are securing the hotel. Tanks are deployed in front of the main entrance. The hotel lobby was busy with a few dozen stranded supporters. They don't seem to have much to do but to sit down and wait. Many of them were wearing white T-shirts from Mr Ouattara's electoral campaign. One supporter said the T-shirts were recently brought in so people could finally change. "We are rather impatient to see Mr Ouattara taking his function officially," a supporter says. "But we know this is something that will happen, so we believe in it very strongly." Some were reading the newspapers while others walked around the lobby. "It's not too bad, we're getting food," someone says. "But we beg the French, the British or the US to help us throw out Mr Gbagbo." With the access to the hotel being denied even to most UN convoys, food and supplies are often air-lifted in. Mr Ouattara did not show up to be interviewed, but his Prime Minister, Guillaume Soro, came to give us the latest. He clearly wants an African force to step in. "Ecowas (West Africa's regional body) can do it while the African Union has already removed dictators by force," he said. "So these are solutions to envisage, to encourage and to support." Meanwhile, his cabinet says it is at work. A long table has been arranged under a big air-conditioned tent and about two dozen computers are available to Mr Ouattara's staff. Mr Ouattara's Foreign Minister, Jean-Marie Kacou-Gervais, looked quite relaxed and confident. "I am a complete foreign minister because in very little time we have been able to completely isolate Mr Gbagbo in every international organisation," he said. "Mr Gbagbo can only express himself on his own TV as all embassies in the world have been informed that he is not the president of this country anymore. "So his men cannot attend any diplomatic meetings." A little further stood Mr Ouattara's government spokesman, Patrick Achi. He believes that controlling the economy is crucial in order to take over Mr Gbagbo's government. "It's one of the key solutions, naturally, because when you cannot control the public finance, you know that after a few weeks you won't be able to do anything anymore," he says. "The heart of power is in finance so this is one of the ways we hope to use to gain control." Mr Ouattara's side seems pretty confident that soon, Mr Gbagbo will not be able to sign off any of the country's spending. World Bank President Robert Zoellick said on Wednesday that he had asked the West African bloc to freeze loans to Ivory Coast. Ministers from the West African Economic and Monetary Union organisation are due to meet to discuss Ivory Coast. At the Golf Hotel of the commercial capital Abidjan, Mr Ouattara's men are up and running as if they were already in charge. This hotel certainly feels like a small state within the state.